What’s more fascinating than a dog breed that sports six toes, has the ability to close his ears and boasts an amazing flexibility which allows him to bend his head backwards, up to the point of touching the spine? No, we are not talking about some science fiction creature or some odd being popping out of a Steven Spielberg’s film. We’re talking about a real dog breed originating from the remote islands of Norway that was selectively bred to perform several interesting tasks! So let’s take a closer look into how this fellow turned out being the amazing creature he is, shall we? Introducing the Norwegian lundehund. Not many people are aware of this little-known dog breed, so today we thought it would be fascinating learning more about these fellows. The Norwegian lundehund is categorized as a spitz-type dog, basically a dog boasting a thick, long coat with a pointed muzzle and often blessed with a tail that curls over the back. If we take a look at the meaning of this breed’s name we can find some clues as to what this special dog was selectively bred for. In Norway, the word “lunde” means puffin, a species of bird found on coastal cliffs or offshore islands. The word “hunde” instead means dog. From these elements we can therefore deduce that this breed was bred to hunt for puffins and their eggs, a line of work that goes as far back as 1600. This bird’s meat was used for food and their feathers were used to make feather beds that were often exported to nearby locations. Amazed by the acts of contortionists you have seen at Cirque du Soleil? Norwegian lundehunds are the contortionists of the canine world. Since puffins live on rocky coasts and narrow passages in the island of Værøy, Norway, the lundehund’s body had to adapt to be capable of accessing these areas where man could not reach. Their head can bend backwards along their spine, a quality known only to reindeer. Their front legs can extend flat to the side allowing them to hug the cliffs. Don’t expect judges though to ask for proof of flexibility in the show ring; these dogs won’t be able to do a demo as they would need to be sufficiently relaxed! Another interesting feature is this breed’s ability to shut their ears by folding them forwards or backwards. This feature allowed the lundehund to protect his ears from dirt and debris when walking through narrow cliff passages. According to the American Kennel Club standard, the ear leather should be capable of being folded and turned up, backward or at right angles, allowing the ear openings to be clamped shut. Ernest Hemingway had an obsession with polydactyl cats, but if he liked dogs, the lundehund would have made a good conversation piece at his place. While several dogs have four toes on their front feet and four on the rear, the lundehund has a minimum of six toes on each foot and elongated rear foot pads, meant to grasp steep vertical cliffs, as he hunted for puffins in their rugged and inaccessible nesting locations. According to breed standard, the extra toes consist of one three-jointed toe and one two-jointed toe which gives the foot an overall strong appearance. While lundehunds were used for many centuries to hunt puffins, their numbers declined dramatically as nets for hunting the birds were crafted in 1850 and puffin birds became a protected species. To make matters worse, several outbreaks of canine distemper taking place during World War II, and then again, in 1963, further decreased their numbers to only 6 specimens. Nowadays, their numbers have risen and there were an estimated 1400 lundehunds in 2010 with about 600 found in Norway and about 350 in the United States. A new interest in this breed has revamped in the airport of Tromsø where they are being considered by Norwegian Air Traffic and Airport Management as a possible solution to fight airplane bird strikes by allowing them to search for bird eggs around the airport. Pretty amazing fellows, aren’t they? 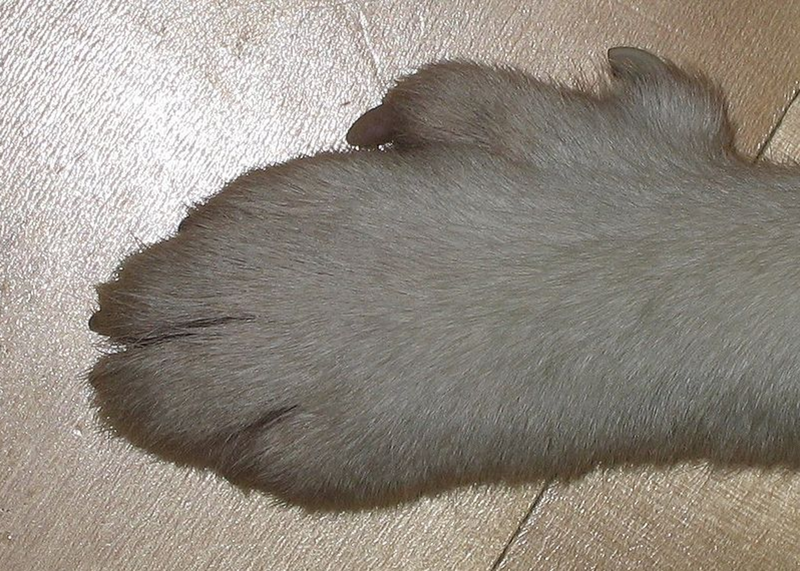 -Wikipedia, Foot of a Norwegian Lundehund. Picture taken by myself, User:ZorroIII, Creative Commons Attribution-Share Alike 3.0 Unported license.